I wanted a DIY advent calendar that would make a huge statement, so I made this one using a big canvas. Kids will love this for Christmas! I'm so thrilled to share this DIY advent calendar with you today! I recently got a passel of paper mache boxes from AC Moore. I don't use paper mache that much, and now I'm wondering why because it paints and decoupages wonderfully. Anyhoo, I laid my boxes out on a table, thinking about what to do with them – then it came to me. DIY advent calendar! Sometimes crafty ideas just land in your brain, and that's exactly what happened. I can honestly say that this is one of the most fun projects I've ever done. Read on to see how I decoupaged it and view more pictures. I'm getting caught up in the holiday magic, what can I say? Paper mache boxes – 25 in various sizes, mine are from AC Moore. They come in some great sets! First of all, you have a big canvas to cover! What I suggest is to take your FolkArt paint (I used Yellow Citron) and create a wash. To do this, pour some paint into a bowl and add water until it's soupy. 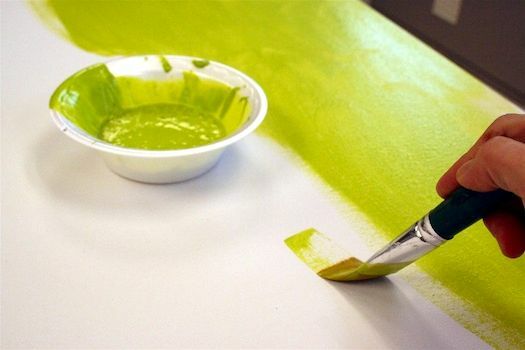 Paint the entire canvas with several coats. If you do this, you'll only have to use two bottles of paint rather than ten. Allow the canvas to dry. 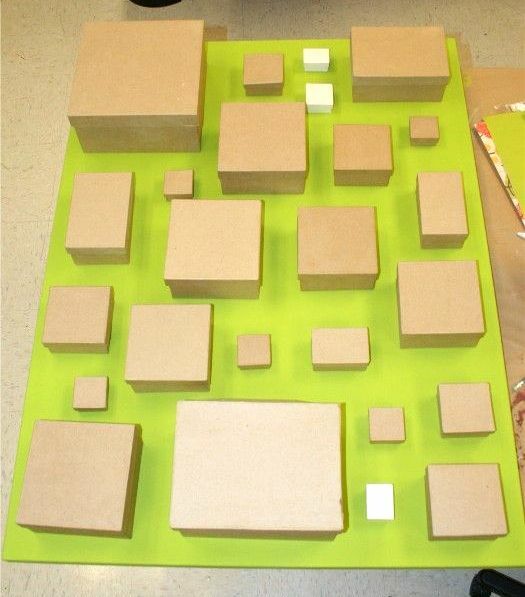 Lay your canvas onto a table and spread out your 25 boxes. At this point you need to decide the layout and then take a picture of it so that you can remember where each box goes. Let me tell you that I almost fell off a mini-ladder taking this photograph. Please photograph your DIY advent calendar boxes at your own risk. 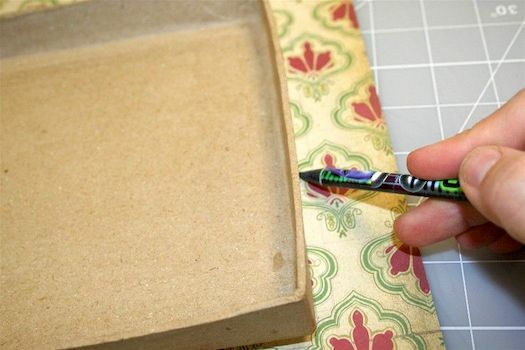 Lay out your papers on top of the boxes, cutting small pieces for the smaller boxes. Arrange the papers so that no two that are alike are right next to each other. 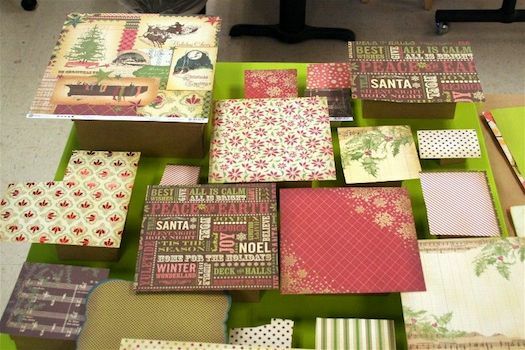 I would estimate that I used about 12 sheets of scrapbook paper – remember that the smaller boxes only use small pieces, so you can use scraps for those. This next step takes some time, so settle in with your favorite Christmas movie. For each piece of paper, lay the corresponding lid down onto the back side and trace with a pencil. Do one lid at a time. 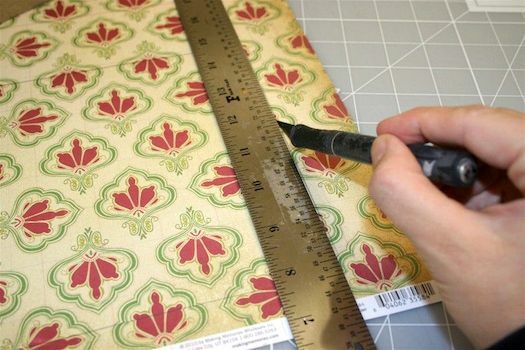 Use your ruler and craft knife to cut each sheet of paper to fit the lid. Work through all 25 boxes and then clean up your big paper mess. Or if you are like me, don't clean up until paper is everywhere and it takes twice as long to clean up. Decide what color you are going to paint each box. This is where the mini sticky notes come in handy. I wrote down the color for each box on a sticky note, placed it on top and then checked to make sure I didn't have all the pink boxes right next to each other. I made a few adjustments on color choices after I laid the whole thing out. Once you've made your decisions, paint the boxes. You don't have to paint the entire tops of the lids, but you should paint the inside so that it's pretty when you open it. I'm watching you. I will know if you don't do it! 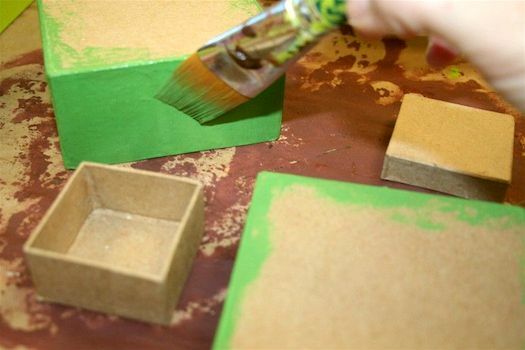 Paint all of the boxes and allow to dry. 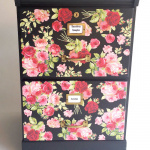 Decoupage the papers down to the tops of the boxes. Work one box at a time. 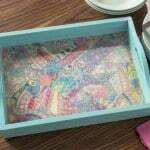 Spread a medium layer of Mod Podge on the top of the box and then smooth down the paper thoroughly. A brayer helps a lot in this situation. 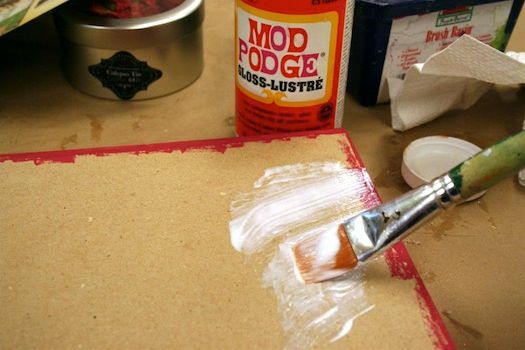 Wipe away any Mod Podge that comes out the sides of the paper with your brush. Allow to dry for 15 – 20 minutes. 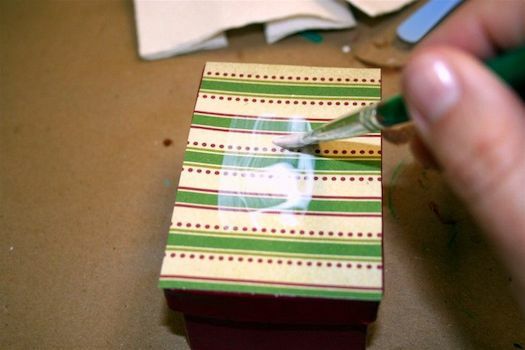 Mod Podge the lids of ALL of the boxes on top of the paper, then decoupage the boxes themselves. 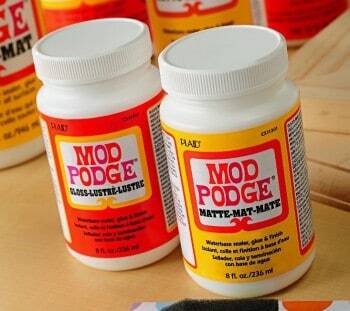 I wouldn't Mod Podge the insides, because it's really not necessary. I wanted to show you this close up of the fun Making Memories Noel paper on box #25 – isn't it awesome? 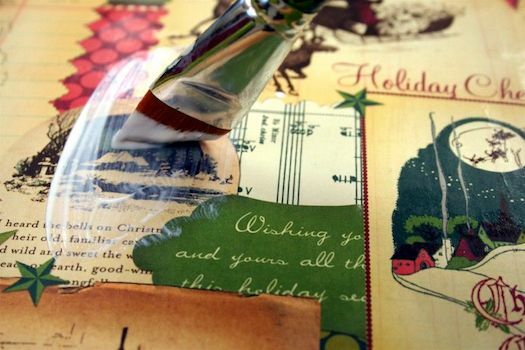 Your DIY advent calendar is getting closer! Paint your wood or chipboard circles with your coordinating paint colors. Why did I add circles? It gives the boxes some interest and texture, and also provided a place to put the numbers on some of the boxes with busier patterns. 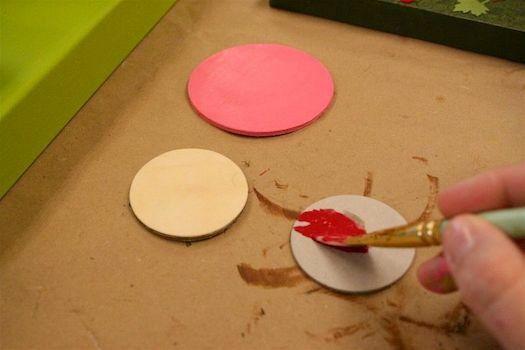 Allow your circles to dry and then Mod Podge them. 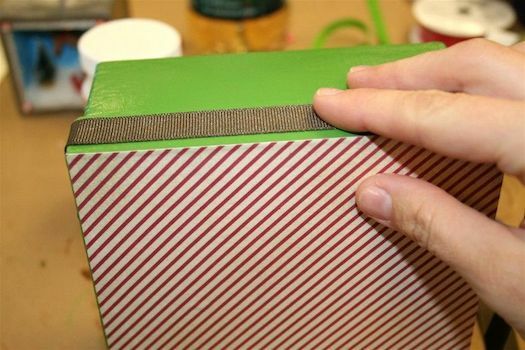 Use your craft glue to add ribbon to some of the boxes. Again, you are adding interest. Not all of the boxes need ribbon, just some of them. I added ribbon across the tops of a few lids as well. Allow the ribbon to dry. I had a BLAST with this part. I used a die cutting machine to cut out the numbers for my boxes . . . in various sizes! 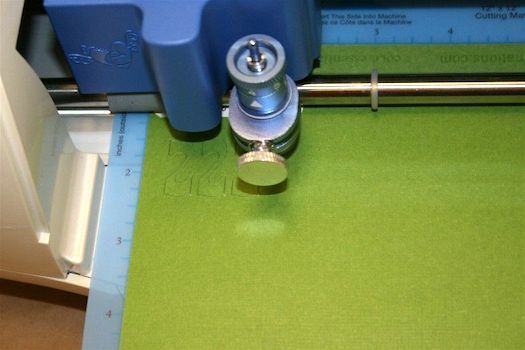 I love using the die cutter – it's just fun. Tip: If you don't have a fancy machine, use clip art to cut out the numbers or buy them as stickers in the scrapbook section of the craft store. 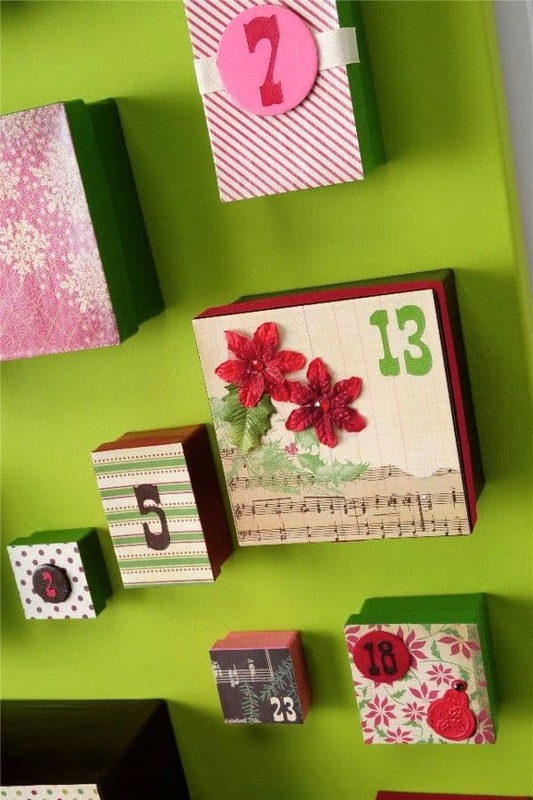 Place a bit of Mod Podge on the center of each box (or wherever you are placing the numbers) and lay the numbers down. 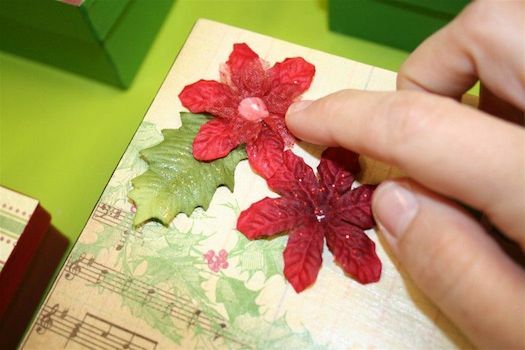 Mod Podge over the top and allow to dry. You can get creative with your placement. As you can see, I didn't put everything in the center. You are about to get serious with some hot glue. I used several large sticks gluing all of the boxes down. If you have a hard time remembering where the boxes go, remember that you took a photo at the very beginning of this project, so that should help. Some of the boxes deserve some floral embellishments. That's where the craft glue and Prima flowers come in. The little container I bought also had some leaves – perfect. 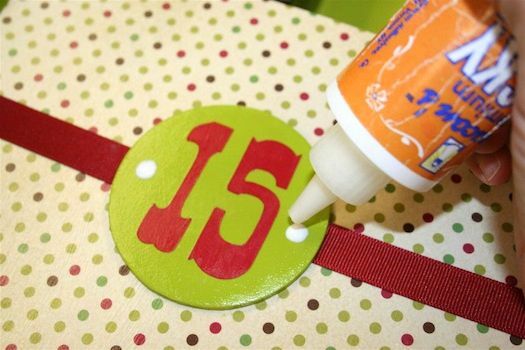 Add rhinestones and buttons where desired with your craft glue and let the entire calendar dry. You can really have fun with where you put this advent calendar, and with all of the things you can put in it. That's why some of the boxes are big and some are small. Candy can go into the smaller boxes and fun gift items into the larger boxes. #25 is the biggest box for that reason! Would you like to see a few more shots? Here's a detail shot of my DIY advent calendar and then me finding a surprise in box #14. Happy Holidays! 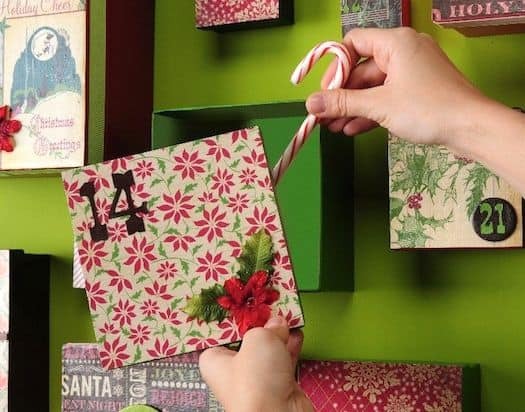 This advent calendar is full of whimsy & style! Thanks so much for sharing Amy!! OMJ!!! This is sooo cool, I LOVE it! What fun!!! AMY!!!! – can you hear me squealing like a little girl all the way from Woodstock???? THIS IS THE MOST FABULOUS PROJECT!!! I wish we had A.C. Moore stores here in GA so I could completely rip off this idea and show it on my blog — j.k. – I will show a snippet and give a link if that’s o.k. with you? You are friggin brilliant! A.C. Moore is awesome too, especially since they buy my Sizzix dies! LOVE IT! How many advent calendars in one house would be considered “over the top”? This is officially the coolest project you have ever done. Hands down! I am in LOVE! Can you send it to me via fedex? Please? Begging here. Please. I’ll give you some extra hugs. I swears. Fabulous project! Excellent tutorial… LOVE your paper choices, great job by you!! I love this idea and am planning my trip to ACMoore right now! Can you tell me about how much it cost you to make this? Oh, wow, that is SO MUCH FUN! I love your idea, and love the beautiful harmonious-yet-eclectic look. Oh boy that is really creative. I love the designs, the color combos and everything about it. Thanks for sharing! Chrissy, I don’t exactly know, unfortunately. I had the paint, the canvas I purchased with a 40% coupon and then I can’t remember how much the boxes were. I’m so sorry! I would say it definitely wasn’t cheap, but it wasn’t outrageous either. You can always downsize it to a smaller canvas to fit your particular budget – and the boxes come in all sizes! awesomeeeeeeeeeeeeeeeeee 🙂 i think i might try this out… 🙂 this week-end!! wow!! We had it in NC, but not in TX. I love this project. I’ve been brainstorming an advent project, but haven’t come up with anything yet. Hopefully I figure out something soon. I love Advent calendars. I think I might make one next weekend for my nephew. I think he might really enjoy this. I cannot believe this!! I adore this! Like, love! 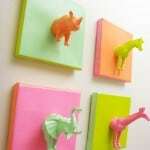 It is an amazing idea and SOOOOOOOOO CUTE! This is so cool! LOVE this idea!!!! Amazing! You never cease to amaze me! I’m featuring this on Aly&Ash today! These are cute in every way, but my favorite part is the varying sizes of the boxes. I’m including this in my Friday Favorites this week! Very beautifull ! what a work ! The best advent calendar I’ve ever seen. Super creative. I love it! Oh my gosh, Amy. This is so freakin’ cute. How did December get here already? I don’t have time to post about all the great advent calendars I’m seeing! 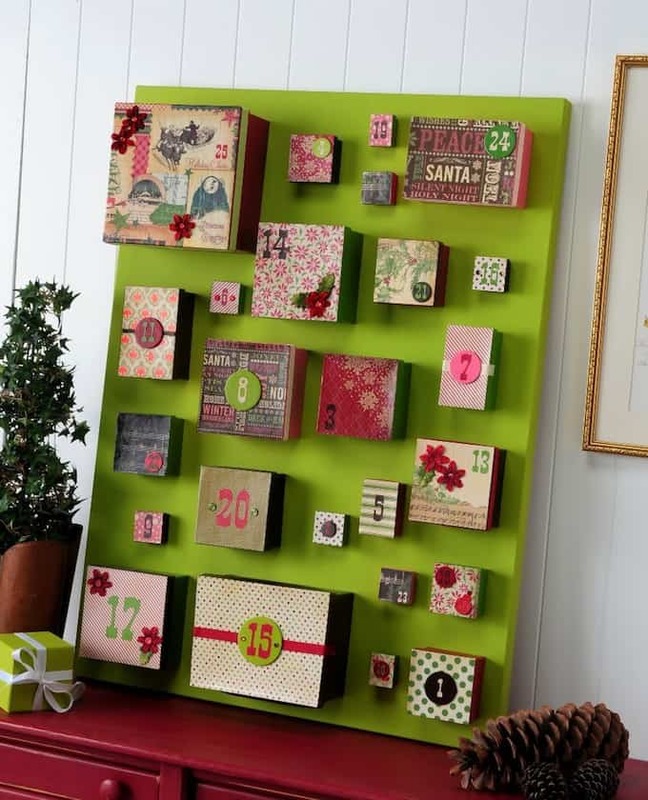 I’m making an advent calendar very similar to this – it’s a great idea! This is one of my favorite advent calendars ever! How fun! I LOVE THIS!!!! It is so pretty. I really think I am going to have to make one. Thanks for sharing! love all your ideas! Thanks for visiting my blog Amy. 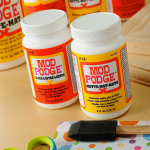 Whenever I have doubts in usage of Mod podge, I visit your site for Mod podge projects. I love the tutorials you have. I love this idea and have *almost* finished making my own, but I’ve run into a problem. My lids are sticking onto my boxes! I have tried sanding them down, but even so many lids are not fitting anymore and others are fitting very tightly. I’m holding off on gluing the boxes down for fear that the lids will never come off to reveal the surprises to be housed inside. Hi Amy Lynn! Please send me an e-mail modpodgerocks at gmail and hopefully I can help! that’s awsome. i want to have one! and i’m curious to know what surprises the boxes are hiding. I hope you will link this up to The cSI Project on Wednesday or Thursday. I know that it is from last year but inspiration never gets old, so link up. This is really genius…and what a perfect idea for a advent!!! 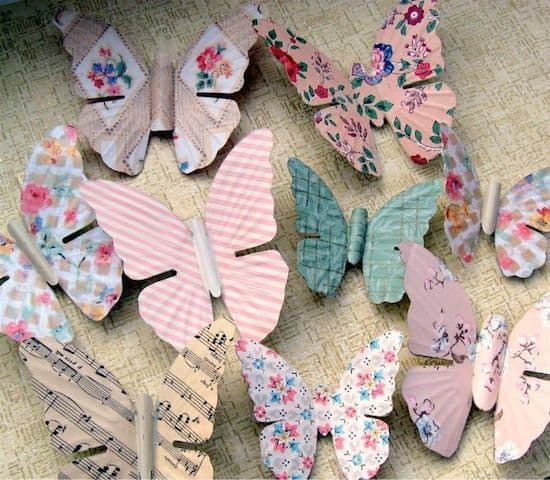 This is truly inspired and I absolutely adore your crafty brain! Plus I love that I could use the tiny boxes I always save for that someday usefulness I hoard things for. This is so wonderful! I would love to do something like this one day! Is there a way to subscribe to your blog by mail?